Being a parent to two adorable cockapoos (Cooper and Murphy) is a lot of fun, but it’s also a lot of responsibility. We all want what’s best for our dogs, all the time. We make sure they’ve eaten enough, are staying hydrated, we take them to the vet to keep them healthy, and get our pups bathed and groomed regularly. All of these tasks are absolutely necessary, but there’s one area where people (myself included) are often lacking – consistently taking our dogs for long walks. There can be little doubt that most dogs love going for a long walk! But after an exhausting, hard day at work, the thought of taking Cooper and Murphy out for a lengthy stroll is rarely as enticing as a glass of wine. We think that our dogs get enough exercise because we take them them around the block or let them out to play in the yard. But there’s a lot more to the walk than just exercise. That’s why we’ve started the Rover-Time Collar Club, to share all the benefits of walking, for both you and your dog. If you’re anything like me, that glass of wine is calling to you and you’re asking, why should I walk my dog? What’s in it for me? Walks are a good way to spend quality time with your dog while honing social skills, training and overall health. Exercise helps drain excess energy to bring your dog to a calmer state and will help him from misbehaving with all that extra energy. The more you walk, the more energy your dog burns, resulting in a less hyperactive dog at home – and less stress on you. 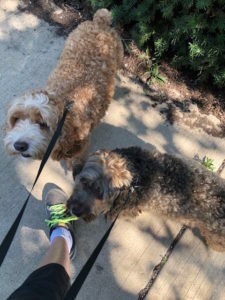 I try to make sure I get my 10,000 steps a day and I can count on my time with Cooper and Murphy to help me towards that. Heading out on a nice, long walk can help keep those extra pounds away for both of you for a year-long health. Humans and dogs both thrive off social interaction and a good walk can provide all that and more. How often have you been out with your dog only to be stopped and asked about its breed or told how cute he is? These small interactions can lead to familiar friendships and ultimately build a sense of community, just like our Rover-Time Collar Club. Sharing a new experience with your dog on a walk can help build self- confidence and reduce anxiety, a common trait in rescue dogs or those new to Chicago. For me, mixing up our walking routine gives us both new experiences keeping our bodies and minds active. For my dogs, they take in the new sights and smells around them. Here’s a tip: If you want to get in a full half hour (or 15 minutes, or however long) pick a loop in your neighborhood that takes a specific amount of time instead of simply walking out and back again. A loop ensures that you cover the distance you want to cover and keeps boredom at bay because you never have to hit the same block twice. Plus, mixing it up can show you a new side of Chicago — it’s how I found my favorite restaurant in our neighborhood. Walking your dog can be a great time to work on training. Try out new commands and carry some treats or his favorite toy as a reward. While out and about, take the opportunity to practice heeling. 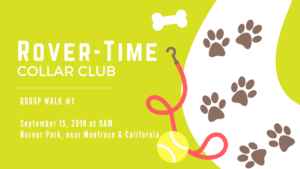 For a more hands-on experience, participants in Rover-Time Collar Club receive tips related to leash training and other techniques taught by a professional trainer. Once you make it a part of your morning or evening routine, your dog will start looking forward to your special bonding time together each day. A nice, calm walk can be very relaxing for you, and gives us an opportunity to unwind or just discover a new side of your neighborhood. The structure helps keep their energy in check and helps you maintain a schedule, all while offering them the opportunity to learn new skills. So, what are you waiting for? Get outside and walk your pooch! AND JOIN US FOR COLLAR CLUB! At the walks we’ll have pet professionals on hand to help you problem solve your dog walking headaches. You’ll also meet new friends and dog-loving neighbors! 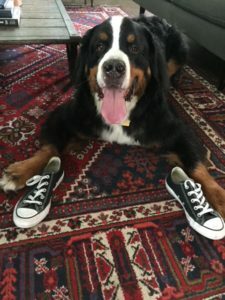 Joanne Tamulewicz is a born and raised Chicagoan from the Southside and currently resides on the Northside in the Lakeview neighborhood with her husband Joe and their two loveable Cockapoos – Cooper (10yrs) and Murphy (5yrs). In her former professional life she was in the Advertising and Marketing Industry for 30+ years. She put that hectic career behind her for a better life/work balance. Joanne is living out her passion for dogs and and joined the Rover-Time family in November 2016.